Panel Built’s exterior metal buildings and prefabricated building systems offer a cost effective alternative to conventional construction. Quicker to construct than stick built, a Panel Built panelized metal buildings offer outstanding quality and value. Panel Built, Inc. offers a new generation of choices in metal buildings. Panel Built’s wide selection of panel finishes, roofing types, and accessories allow us to tailor a prefabricated building system to fit your specific needs. Expandable and relocatable, Panel Built exterior modular walls allow for future growth and mobility. The system’s flexibility to withstand hurricane and earthquake conditions, speed of project construction, as well as its ability to meet tough building codes, makes it a smart choice for equipment enclosures, crane or fork-liftable metal buildings, guard shacks, storage buildings, or even a large modular office building or commercial facility. Quick and easy to erect. Economical. We offer the highest quality at the best metal building prices. 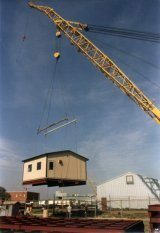 Built to heavy industrial standards, our fork-liftable and crane-liftable prefabricated structures offer full-depth fork pockets and welded structural steel base. From modular offices to retail space to commercial metal buildings, PBI can provide an economical prefabricated building solution. We offer a complete package including value engineering and design-build construction services. From equipment enclosures, communication shelters, and metal storage buildings to chemical containment and remote housing, PBI has a metal structure for you. From large school facilities to single classroom metal buildings, Panel Built steel structures look better, last longer and are more versatile than your typical trailer unit.